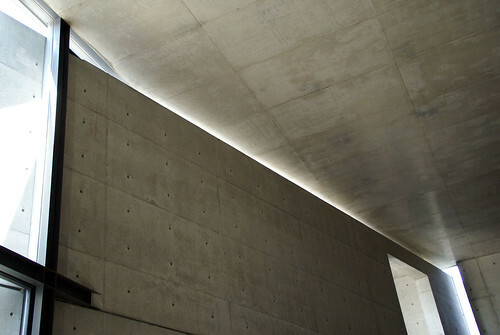 It's impossible for any architecture student to make it through five years of school without being exposed to Tadao Ando's work. 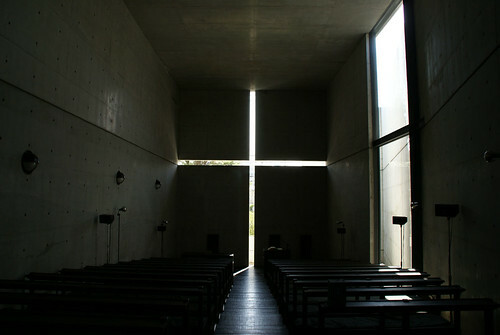 Winner of the 18th Pritzker Prize, the Church of Light in Ibaraki is his most notable work and a fine example of his material of choice, concrete. 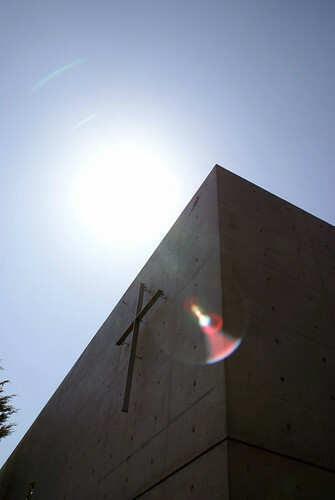 The Osaka-based, self-taught architect designed the nearby church with an extremely limited budget; facing the possibility of a roofless church, even the construction firm, Tatsumi Kensetsu Co., pitched in by donating the roof. And the furniture? 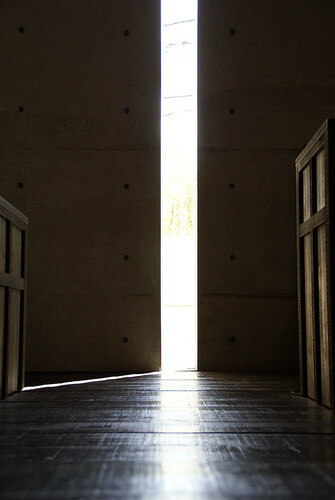 Iseki Co. salvaged the wood from the concrete formwork. Initially, I was under the impression that the Church of Light, like the Church / Chapel on the Water was out in the wilderness, or at the very least, a plaza-like space where swaths of concrete provide a buffer against the less inspired structures in the area. There's good reason why there are few exterior shots of the Church of Light (which I've provided to the left) and it's because it sits at the corner of a nondescript intersection in a nondescript suburban neighborhood, there really isn't anything on the exterior warranting photographs. In contrast, Church / Chapel on the Water (from what I can tell in the photos) visitors are isolated from the rest of civilization once they arrive in the area. In fact, visitors probably feel pretty damn isolated from the moment they step onto Hokkaidō. Other than the city, some ski resorts, the Sapporo brewery and a Honda Takasu Proving Center I read about, there doesn't seem to be much of anything else on the northern-most island of Japan. With that said, there is no need to enclose its visitors, it opens up to its surroundings, literally. The cruciform sits out on the water, and a larger sliding glass wall separates the congregation from the elements on harsh days. Back in Ibaraki, the Church of Light employs a different tactic to induce a shot of spiritual awesomeness. Stepping into it's cave-like interior, the church closes off a visitor to the neighborhood and though I describe it to be like a cave, it still feels oddly airy and not claustrophobic. The interplay of light, shadow, the cool air, the silence and the solidity of the walls all combine to encourage a moment of clear-mindedness. Your troubles are left at the entrance, the only thing that matters in that space is you and your connection to a greater power (whatever that may be). 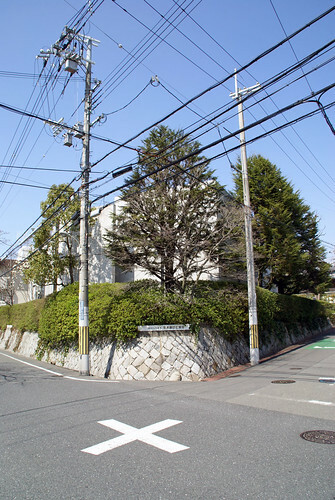 In Ando's self-administered architectural education, he mentions studying the temples and shrines in Kyoto and Nara. As a visitor to those very same temples and shrines, I'm glad Ando was able to distill whatever principles, ideas or construction methods he was able to pull from those visits and reinterpret them in his contemporary style. My visits to those temples in Kyoto, Koyasan and the Big Buddha in Nara were all trips I took because I felt that I should, but I'd be lying if I said I really enjoyed them. Prior to my visits, I was expecting to feel some spiritual awakening or a connection to my parent's faith but I walked away empty. I'll cover this more in depth when I retrace my trip out West. Walking into Ando's Church of Light was a moving experience. Part of it was probably all the anticipation built up during my college years; but that could have gone either way. Even with my expectations set amazingly high, Ando's church met and exceeded them. The one photo that is always shown is of the East Wall with the cruciform. I never researched the building in depth to see whether or not it was sealed up and in reality it is. 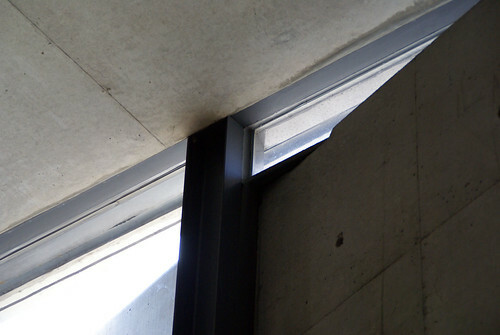 I felt that it would've made more of an impact if the opening wasn't sealed up by glass but it is about the light after all and not the airflow, opening it up would also expose visitors to the exterior noise which would have taken away from the experience. The seams created by the sheets of glass really bother me though. I guess one way to work around it is to build a glass enclosure at that end of the box. The curiciform would be open and the sheets of glass would allow light to come through while blocking out rain, snow and noise. The budget wouldn't have allowed it anyway. 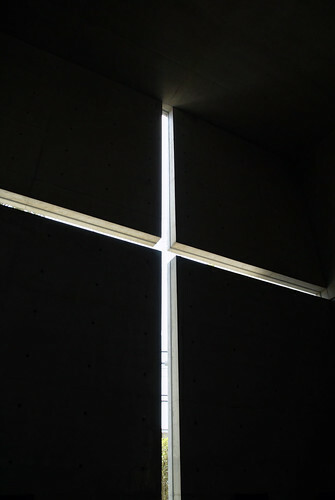 Elsewhere in the Church, little details such as the connection between the South wall and the roof where a sliver of light passes through makes the roof feel lighter than it is and adds to the airy feel of the interior. The intersection of the South and West walls also features a narrow window running the entire height of the wall. Though not much is made of these two features, I'm assuming the light filtering through eases the visitor into an otherwise dark Church. 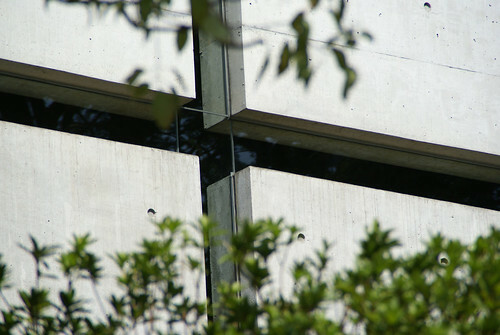 Concrete is Ando's material of choice, his ability to get the builders / contractors to pour concrete of such high quality has gotten a lot of praise so it was surprising for me to see some unevenness in the seams. Guess no one is perfect. Touching "Ando Concrete" was almost a spiritual event in itself so regardless of how uneven the formwork was (only slightly), I really appreciated the finish. To get a better understanding of all the work that goes into "Ando Concrete" check out this write-up by Steven J. Morby who describes the process of pouring concrete for The Pulitzer Foundation for the Arts. During my visit I also bumped into a few interesting individuals. Featured in one of my photos is Tsuji Katsumi who walked into the Church with me. He helped me take a few photos and also made a huge deal about the equinox which occurred the day before. I guess he wanted to experience the Church during the equinox though I'm not sure what, if any effect it has on the experience. I also met a Mexican architect (and his family) by the name of Arturo Hernández Hernández. It looked as though they had been in the Church for a while when I walked into the Church with Tsuji. We had a brief conversation about the Church, Ando's work in the surrounding area, and concrete before they left. Told me to look him up if I was ever down in Jalisco, Mexico and wanted to see some of the sights down there. By the time the keeper locked up the Church for lunch, I was the only visitor left. I hung around the courtyard taking in the exterior and the Sunday school addition (built in 1999) when two Taiwanese architectural students showed up for a visit. Spoke with them briefly before heading back to the bus stop. Wish I had made such pilgrimages during my school years. It may have recharged my batteries before all hope was lost. 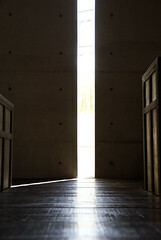 Additional information on Tadao Ando, and an interview on CNN / Talk Asia (videos don't seem to be working). What you need to know can be found on this informative site, Galinsky. The only two pieces of information I'll add is the following: When visiting, come early in the morning or after lunch (1pm). The gentleman who looks after the Church closes everything off between noon and 1pm for lunch. Second, when you get off the Kasugaoka-koen bus stop, it took a little while for me to get my bearings since the sun was so high in the sky. The park should be on your left hand side, just make a 180 degree turn and walk back towards the intersection where the bus made a left. At the intersection, make a left, walk one block and the Church will be situated diagonally across the street from you.